It was intended to be a peaceful event to educate students on Islam and the meaning of the hijab, a traditional headscarf worn by Muslim women, but by the end of the afternoon it was an all-out impassioned debate about freedom of speech and religion. 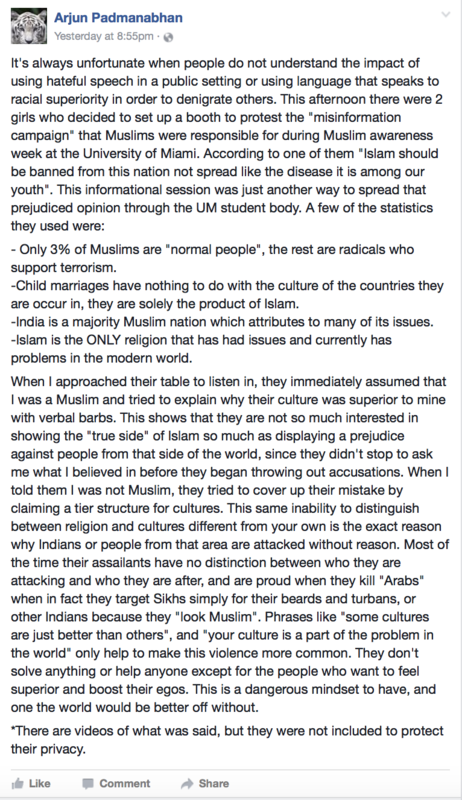 This was March 21, the Tuesday of the second annual Islam Awareness Week, hosted by Muslim Students of the University of Miami (MSUM). The organization was holding a Hijab-a-thon event, where students could try on hijabs and learn about the significance of the garb. About 100 students visited the table on the Lakeside Patio, trying on hijabs of different styles, colors and textures. MSUM members supplied the fabric, which students could keep, and assisted the men and women who stopped by in putting them on. The mood at the event took a turn around 1 p.m., when a man approached the table and told the Muslim women wearing hijabs to “tone it down” and not make others uncomfortable. Sasha Baranov, associate justice for the Supreme Court of Student Government, said the unidentified man told the students that if people felt threatened by the hijab, Muslim women should make an effort not to wear them. 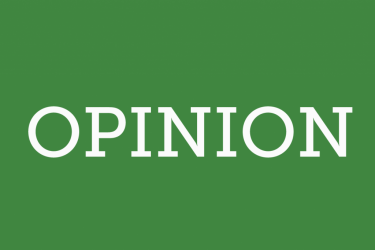 Though the hijab has been characterized by critics as a tool of oppression, MSUM president Aya Eltantawy said it is perceived differently by the women who wear it. 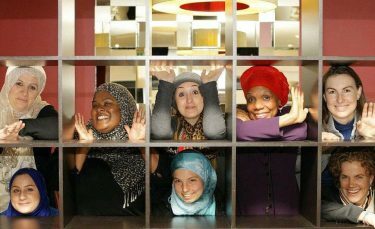 For MSUM members, including former president Rowanne Ali, that interaction was a reminder of why they hosted a Hijab-a-thon in the first place. The incident was the first confrontation during Islam Awareness Week, according to MSUM members, but it would not be the last. On the same day as the Hijab-a-Thon, junior Sarah Samuels hosted a “counter information session.” More than 100 students had something to say about her stance when she posted on Facebook about her event over spring break. She wrote that her event aimed to show “what it’s really like to be a woman of Islam.” With approval from the university, Samuels set up a table in the Breezeway and handed out pamphlets about the issues in Islam and Muslim-majority countries. She declined an interview at the event. Tabling with her was Driena Sixto, a Florida International University student and field director of the South Florida chapter of Turning Point USA, a conservative grassroots non-profit. Sixto said she wanted to focus on issues such as child brides, female genital mutilation and honor killings. Samuels had mentioned the same three topics in a phone interview with The Miami Hurricane over the weekend. During the event, Sixto and Samuels also spoke about banning Islam from the United States until the religion was reformed. Baranov approached their table after he participated in Hijab-a-Thon. He spoke to Samuels about her opinions on Islam but also asked for her thoughts on hate speech. Heated debate grew around the table, with at least 40 students hovering around the action at one point. Administrators and plainclothes UM police officers lingered in the area to make sure things didn’t get out of hand. Videos circulating social media showed passionate exchanges between the tablers and both Muslim and non-Muslim students, everyone asking pointed questions and pulling up supporting evidence. Below is a video taken by one of the students confronting the tablers. Sixto also took a video during this encounter of a student’s response to the accusation that Islam condones violence against women. Arjun Padmanabhan, one of the students speaking with Sixto in the video above reacted later on social media. Students like Baranov, while still debating, helped Samuels keep her signs and pamphlets from blowing away in the breeze. MSUM members walked over from the Hijab-a-Thon and gave Sixto and Samuels pamphlets, which they took and said they would read. The crowd lasted well until 4 p.m., at which point Student Government and other administrators asked them to disperse. Davin Laskin, a junior majoring in economics, said he knew Samuels because she was starting a chapter of Turning Point USA and he was starting a chapter of Young Americans for Liberty, a partner organization. One major platform they have in common is promoting free speech. The events for Islam Awareness Week will go on as planned, though Tuesday was an eye-opener for students in MSUM. 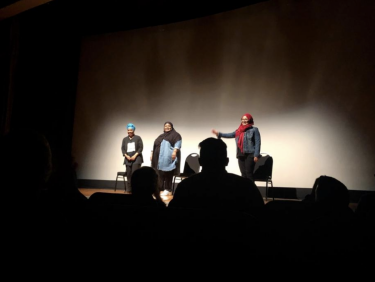 “We have definitely become more realistic about the world we live in because it’s forced us to take a step back and say, ‘If we are putting on Islamic-related events, anything related to the religion, it will receive some sort of backlash,’” said Nabiha Khakoo, secretary of MSUM.